Saturday Sew was a fun and productive day. Pine Needles quilt shop has such a wonderful space for creating. 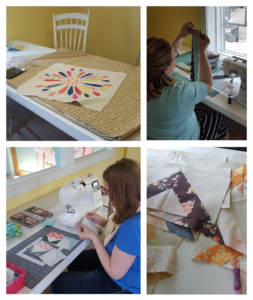 Mark your calendars – our next Saturday Sew is July 8th. Join us for fun, laughter, and stitching fun. May was our annual guild Mini Swap. Thanks to everyone who made it and participated. The May Quilt of the Month, free for Modern Quilt Guild members, L is For… by Sarah Ruiz. Click here for instructions. We have the perfect charity block solution to destash your stash – Scrappy Trip Around the World blocks! These blocks whip up in no time and each block only requires 6 – 2.5″ x 16″ strips of fabric. Follow this tutorial here. Quick Note: We’d like our blocks to have a solid black or dark gray center strip (which is the brown strip in the tutorial block). 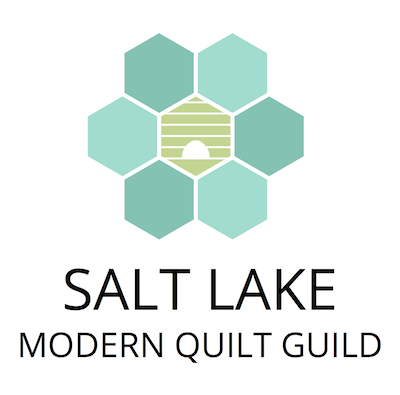 Next Guild Meeting – Thursday, June 15th from 7-9pm at the Handi Quilter building (501 N 400 W, North Salt Lake, UT 84054). Charity Sew Night: Looking to use up some of your stash? 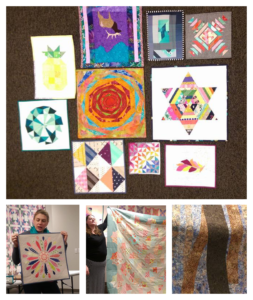 Bring your scraps and sewing machines and help us sew up some blocks for our charity quilts. Next Saturday Sew Day – Saturday, July 8th from 10-3pm at Pine Needles (1100 W 7800 S #29, West Jordan, UT 84088). 2017 SLMQG Retreat – It’s going to happen this year! Mark your calendar: September 14-16, 2017, Bear Lake. The retreat is open to all SLMQG members. Join us for a stitch fun time! Click here for more information and to sign up.